We opened the wall between the kitchen and the dining room and we like the light that that has been added. 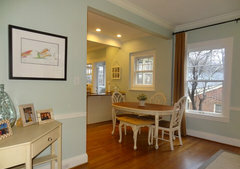 The walls are painted Benjamin Moore Philadelphia Cream. If you don't need them for light or privacy control then definitely no window treatments. Your moldings and woodwork are beautiful. Yes your windows are beautiful, however, adding window treatments are not just for privacy and light control. 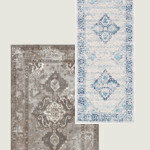 Fabric adds color, pattern and softness to your rooms, and can also make a beautiful statement. I would add panels on each side of your windows and hang them with medallions. Then you will have no heavy drapery rods. I totally agree with rawketgrl. 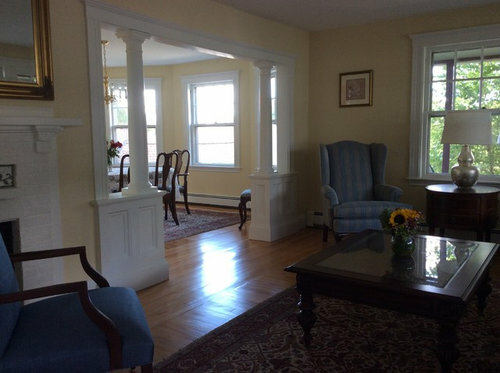 The windows and moldings are spectacular! (Beautiful wall color as well). 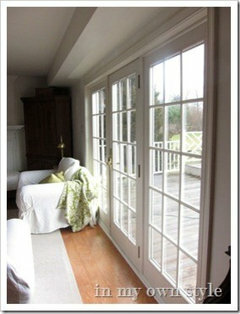 Here are photos of similar windows with and without window coverings. I like the no window covering option much more. 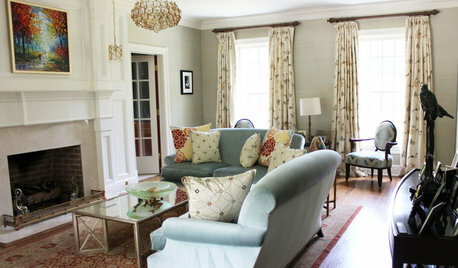 Frequently it is heavy drapery that really makes a room look dated quickly. But....if you like a bit more tradition look/warmth etc you can add some, your furniture is very neutral so you have room to add pattern and color. 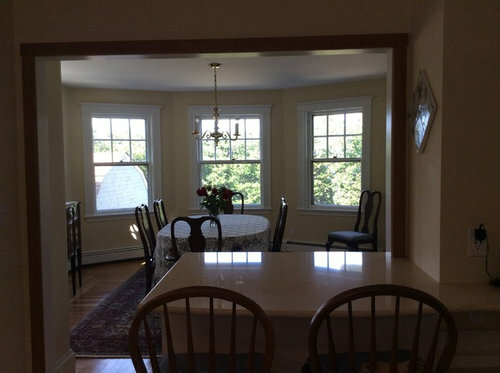 The dining room windows overlook my perennial garden, but the living room windows overlook the street. I was considering silhouettes and drapes for the living room, but I think it would look odd to have them in one room but not the other. 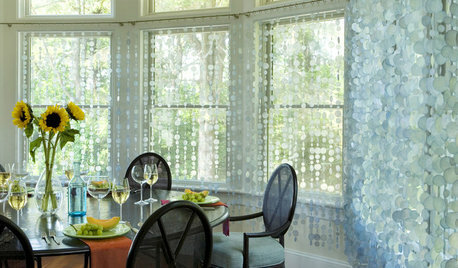 Silhouette drapes won't detract from your great windows. Yes, I would do the same in both rooms for continuity. Yes, I agree with KCR Interiors - the windows need something, as beautiful as the moldings are - the windows look unfinished. 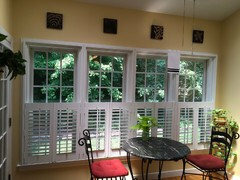 We installed Hunter Douglas plantation shutters in a window similar to yours. It's true that they needed privacy, but it is a very elegant look. By using a 3 1/2 inch for 4 1/2 inch louver it allows for great see through. I like the shutter idea - another option: For the street side windows you could add shirred panels inside the molding about 3/4of the way up the window - would provide privacy and allow light in. You'll need a pocket at the top and bottom of the panel and 2 rods for each that fit across the window between the molding. Place one so the bottom header/footer just touches the sill and the other at where you want the top of the panel to be. If french windows, align the top with the horizontal molding under the top row of panes. Even sheers, if full enough, can provide privacy hung this way. that would interrupt the flow between the two rooms. 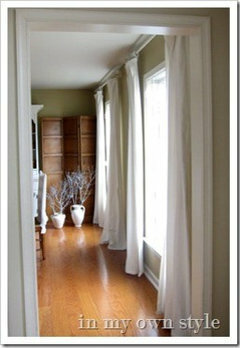 You have gorgeous windows with beautiful moldings that can definitely be enhanced with window treatments. I would suggest drapery panels that would complement your windows and moldings but would also continue to allow the sunshine to come through. I would be happy to discuss your needs further via phone or email. We have over 400 materials to choose from for our draperies and I would be happy to send you some swatches of our fabrics as well. In addition, we have a great rendering service that can provide you with an idea of what your windows would look like before you make a final decision. I look forward to helping you further on your project. Rooms look beautiful because of all the daylight; however, it also looks a little cold...just need that finished look with draperies. Your windows/trim are gorgeous, as is the rest of your decor! 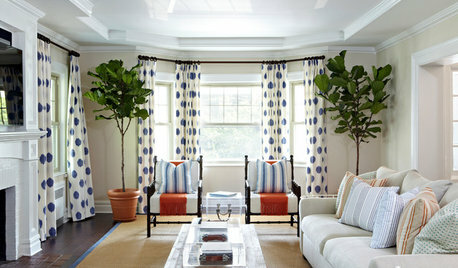 But, I would always opt for fabric window treatments. While plantation shutters look great from the outside, would you open them in order to see outside and to get light coming in? I would never have them in my home because I want to see outside! I would go with grommet top panels. They can be open all day and then closed when needed. Roman shades can work, too if they are operable. Sheer linen panels or top treatments would soften the look of the room without cutting out the light. Your windows and trim are beautiful, but lacking COLOR! I agree, panels framing the bay windows would look fantastic. I would propose something light, but private. UV light should also be a concern, given your furniture near the windows. 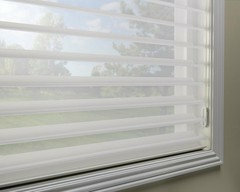 Our suggestion would be the Hunter Douglas Nantucket or Silhouette. They will give you privacy, light control, AND UV light control...even in the open position! 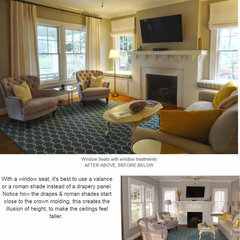 Although Halcyon Shades makes a great point, we feel that in some cases (like our 2 projects below) window treatments of any kind would take away from the beauty of the windows and would completely change the elegance of the rooms and make them look "dated" immediately. Both of these homes overlook ocean and the clients did not want anything impeding the views. We thing the decision to not use window coverings was a good decision. Hi ktuffy. Your space is lovely. The windows allow in light, and it helps your rooms look "happy." 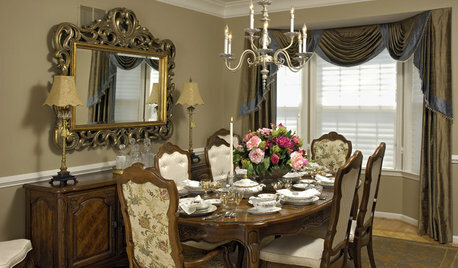 I would suggest in your dining room hanging four drapery panels along side each window. These would help anchor the space and add a bit or color or texture. In the living room, I wouldn't suggest panels because of the furniture placement. I would suggest roman shades, either in a woven wood or a fabric. 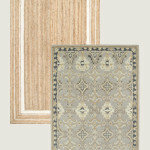 The two rooms should coordinate with either other with similar color (unless you go with a woven wood. Designing interior spaces is so subjective. You can have 50 different ideas from 50 different people. Play with you options and you'll come across what makes you happy. There are so many window treatment options to choose from. I suggest like the comment above Roman Shades in either a natural material or a beautiful colorful fabric. Window treatments would be a great addition to the space. If window treatments (drapes) are hung OUTSIDE the windows they won't block daylight, but they'll allow the warmth, color, texture, sound absorption, and privacy options! These rooms were right next to each other, in the living room, we used ivory linen, in the adjacent room, we did a CONTRAST vertical BORDER in the ivory linen, with the rest of the drape in camel. Notice the combination of styles....which compliment each other. 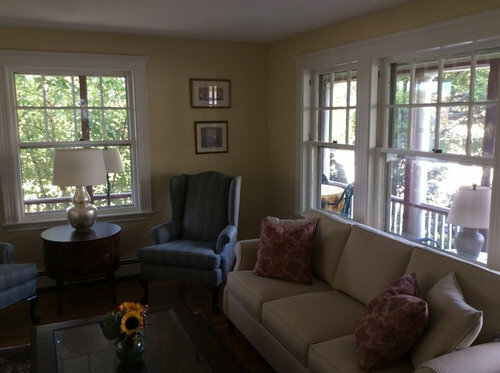 The client was surprised at how much taller her windows felt, and how much bigger the rooms looked after we hung window treatments. You can see lots more BEFORE and AFTER if you click on the above photos. Yes, your windows ARE beautiful. But I do think some sort of treatment is needed on the windows to help balance the room. If you study the photos you will notice that there is a lot of "weight" near the floor in the room. Adding some fabric, with either color, or just texture, on the walls will keep it in balance. I agree with KCR Interiors LLC; your windows are beautiful, but window treatments also complete the design composition and soften the room. A good light option would be inside mount soft romans, even made out of sheer fabric would make a significant difference. 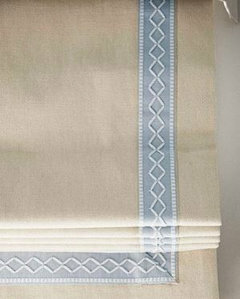 If you don't need them operable there's an option of crating a valance that looks like a stacked-up soft roman shade. 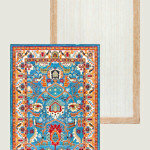 Light and airy side panels would look beautiful between your bay windows. Plantation Shutters would be stunning on these windows...it would enhance the beauty of all of the wood work and trim you are already blessed with!! Your windows are beautiful, and I love the renovation job. 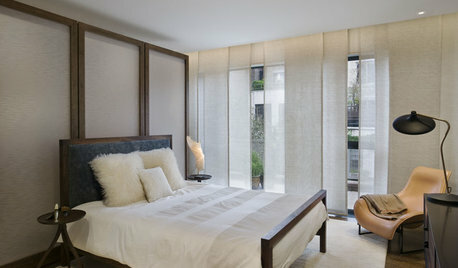 Having window treatments is very important, and it will add warmth to your rooms. The Pros advice on this project is all good. No way would I cover a gorgeous window and trim if there was a view. However, if it is on the street, then I would go with silouhette or shutters inside the window. I would keep the shutters inside the frame And I would do the room that needs covering first and then if I didn't like the lack of flow from one room to the next, then I would order the set for the other room. Gorgeous gorgeous space and windows. I completely agree that the window trim shouldn't be covered. 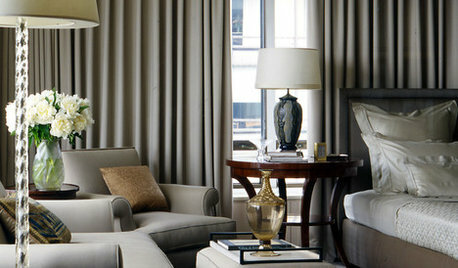 An inside mounted Roman shade in a very classic/neutral color, perhaps accented with a trim could really POP your home. 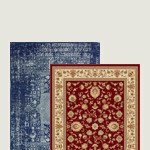 A trimmed Roman in red(to coordinate with your throw pillows on the sofa, would be lovely. I sure do look forward to your final design! What a beautiful space you have. I love that there are as many opinions as there are options, it's just like real life! Anyway (if it's not too late), one of the things I always talk with clients about when they are considering "to cover or not to cover" hasn't been mentioned. 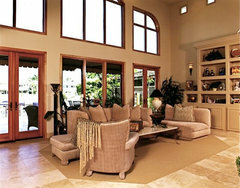 Other than privacy, light control, insulation and the decorative effect of window treatments there is another benefit. You eliminate the black hole at the windows that happens as soon as the sun goes down, and up here in Canada that is much of the time that we are home in the winter months. The glassy black reflective surface of bare windows at night does nothing to warm up your temperature or mood. I like the suggestions of Silhouettes, Shutters, or Roman Shades. Silhouettes are soft, can control light in an elegant way, and tuck up under a discrete headrail/cassette very nicely. 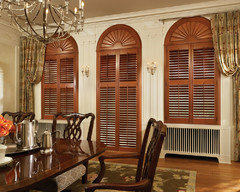 Shutters can add an architectural element to the room, almost an extension of that great trim you have. Roman Shades would be warm, tailored, and luxurious, but keep in mind they almost always look better 2/3 of the way up, then totally drawn (as in the pictures above). Good luck with your decision, it would be great to see the after pictures to see how it all turned out for you. 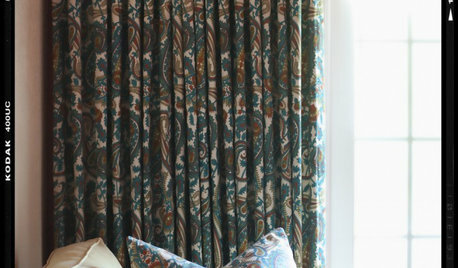 Simple window treatments would look beautiful in your home! In addition to just the appearance, window treatments would also help with any heat/UV protection in your home. If you have furniture near your windows, it may be beneficial to add some window coverings to your windows. I would love to see some sheer drapery, or even simple Roman Shades. Agreed that if you don't need them for functional reasons leave them open! If you do need privacy consider roman shades. Thinking of adding tabbed valance (hotel white w 2 narrow black stripes on bottom). ( paper example in pic) Advice? 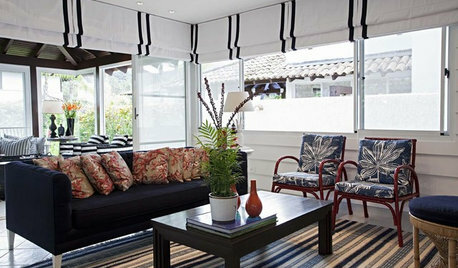 You can add more softness & privacy into your room with new window treatment designs, if you need. I totally agree with many others in the thread who supports no window treatments for those beautiful moldings and woodwork. They are so elegant and my personal view is to stick with a no window cover option. Nevertheless, many windows and door company in Madison suggest that the benefits of natural light on our health and energy usage is significant. Science says that natural lighting makes people more productive, happier, calmer and healthier. Having said that, having the right window treatment can bring in a world of difference. Enhancing windows with the right shades of curtains, shutters would simply make them the focal point. Among few modern window treatment ideas roller shades, solar shades, and wood blinds are good options. But if you consider privacy there are different window treatments forms like the valances, drape, curtains, blinds, panels, swags, roman shades, shutters, cornices to mention a few. Furniture or window treatment first? 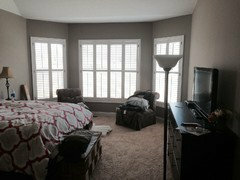 I need seriously help with window treatment ideas!! Barley Heavy FauxLinen Curtain Single Panel, 50"x108"
Triad Indigo Printed Cotton Twill Curtain Single Panel, 50"x96"
Suez Natural Embroidered FauxLinen Sheer Curtain Single Panel, 50"x96"
Eggnog Doublewide Blackout Curtain Single Panel, 100"x108"